Keeping your car clean in the winter is important, but it can also be a challenge. Road salt, dirt, and grime can wear down your Jeep’s exterior, leaving it without its gorgeous shine. 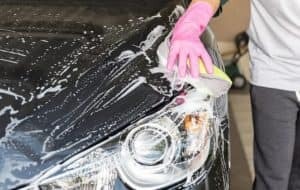 By regularly visiting one of the following car washes and detailers in the Indianapolis area, you can keep your beloved car clean throughout the season while saving yourself some extra effort. The Crew Car Wash won the Best of 2016 award for facilities of its kind in the Indianapolis area. You can have virtually any of your car-washing needs met at the Crew Car Wash, which offers everything from self-service to unlimited washes with a membership and so much more. The staff at this car wash is what makes the difference, though. They will re-wash your car for free if you’re not satisfied, and they offer a mix of safe cleaning solutions with touchless dryers to protect your Jeep as much as possible. Beyond giving fantastic car washes, the Crew Car Wash is also active in the Indy community. You can hold your organization’s fundraiser here, and the facility donates regularly to local charities. You can feel good about getting your car cleaned, at a fair price and by a great staff, while also contributing to your community. It’s a win-win! In the top five of 2016 — and for good reason — the Sparkling Image Car Wash can help you keep your Jeep pristine. One great feature of this facility is that they focus on cleaning the undercarriage of your car, which is particularly important in the winter. This facility even offers unlimited wash plans for multiple vehicles, to suit all the Jeep drivers in your household. Stop worrying about road salt eroding the more delicate parts of your car and have them cleaned, waxed, and protected at Sparkling Image. At the Car Wash King & Detail Center, you can benefit from professional car wash services as well as detailing services. These detailing services cover everywhere from waxing to carpet shampooing, interior super cleans, and so much more. If you love your Jeep, or if you think it could use a good scrubbing inside and out, then the Car Wash King is the place for you. If you’re a do-it-yourselfer, the self-service bays at Bubbleland Car Wash will feel like Candyland to you. You’ll find everything you need to clean your car thoroughly, from bug remover to foam conditioner. By stopping by this car wash and using their resources, you can help keep your car well protected during the harsh winter weather. There’s also touch-free laser washes you can use if it’s too cold to roll up your sleeves. There are a number of car washing establishments in the Indy area, but these four seem to stand out. Stop by one of these facilities next time you’re out and about, and give your Jeep the cleaning care it deserves.